Coach Croley is a native of Toledo, Ohio and graduated from the Virginia Military Institute in 1994 with a degree in Mechanical Engineering. He established the Virginia Beach Hockey Club and the Challenge Team in 2012 after receiving a Sled Hockey Grant from USA Hockey. 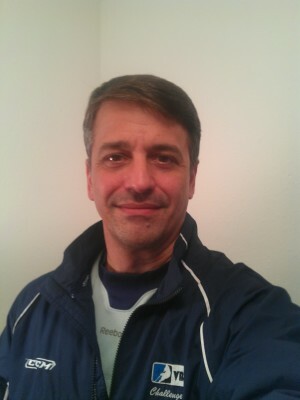 He is an active player and a Level 2 USA Hockey Coach and has experience with youth, adult and disabled hockey. Coach Croley is also the President of the Iceland Board of Directors. Coach Fleetwood is a native of Downers Grove, Illinois but didn’t discover hockey until 2003 while stationed in Norfolk, VA with the Navy. Coach Fleetwood expanded his knowledge and skill by attending several adult learn-to-play sessions and playing on men’s league teams at every competitive level. His coaching career began in early 2012 with the Virginia Beach Hockey Club mainly teaching learn-to-skate and the VBHC Destroyers Sled Team. He also leads and coaches the successful VBHC D-League adult learn-to-play program and has coached for the Hampton Roads Youth Hockey Association (HRYHA). Coach Fleetwood is a Level 4 USA Hockey certified coach. Annie has volunteered with the VBHC Destroyers Sled team since the spring of 2016. She primarily manages the logistics and day-to-day responsibilities of the program, yet also enjoys being on the ice with the athletes. Annie played lacrosse at ODU, presently coaches at Bishop Sullivan Catholic High School, and has extensive coaching experience at the middle and high school levels. She previously taught 6th grade special education and currently works as a speech-language pathologist who specializes in the treatment of brain injuries. Annie has dedicated most of her career to enhancing the abilities of military services members with a history of mild brain injury, but also likes treating other individuals with various neurological disorders. Coach Rich Appleby grew up in Detroit Michigan and began his coaching career in 1973 at the midget level. 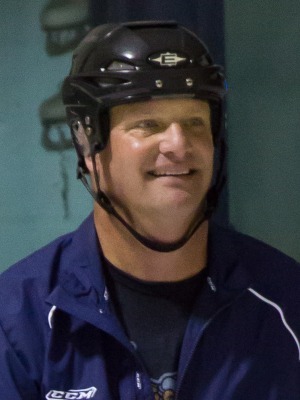 After taking his team to the Michigan State Championships in their second year, Coach Appleby took a break from coaching and resumed his playing career with the Detroit Nomads and Hudepohl Brewers until 1978 when he stopped playing after suffering a fractured kneecap. After moving to Virginia Beach Coach Appleby became involved with the Hampton Roads Youth Hockey Association as VP of Business Operations and coach. He took over the Travel program and amassed a 186-25-12 record with his teams winning 4 league championships in the Carolina Hockey League and over 21 tournaments in 5 years. Coach Appleby is a Level 4 USA Hockey certified coach and has a simple hockey philosophy-PRACTICE HARD/PLAY HARD. Coach Appleby teaches a puck control strategy with tape to tape passing, aggressive skating, and tight team defense.